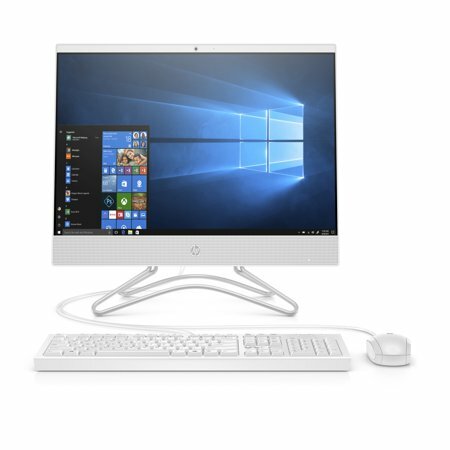 Upgrade your computing experience with the HP 22 All-in-One PC 21.5&quot; Touch, 22-C0063W. It comes pre-loaded with an Intel Celeron G4900T processor, a 1TB hard drive and 4GB of RAM for efficiency and for easily running multiple programs. Intel UHD Graphics 630 capabilities deliver sharp and colorful visuals, while a 10-point touch screen provides an easy-to-use interface when using this All-in-One desktop PC. Create your own DVDs and connect external devices via the multiple USB ports or Bluetooth. There is also the option to connect HDMI and to join a wired or wireless network. A keyboard and mouse are included with this HP desktop PC. This computer is great for my home office. It is light weight and easy to move. The screen is extra wide at 21.5 inches with bright lighting. It has a dual core processor. It's speed surpasses any computer I have used until now and it has 1 tb of storage. The color fits in with everything as it's white and black. It comes with everything you need including the keyboard, mouse, and all the cords. The operating system is Windows 10. It comes with a high quality camera which has many features including timer. It has a dvd drive which is re writable. It sits on a sleek light weight silver gray stand. You can move the screen forward and back to increase visibility. All in all it's great. This was the perfect unit for my daughter to use for school and entertainment. The fact there isn't a CPU to attached saves space and makes it easy to plug and go right in her room. The clarity and speed is perfect for her schooling and the must have YouTube videos. Wow I love this computer, it is compact for my desk and office space. I am so impressed by the screen and speed. Thw resolution is great! I loaded Microsoft and it disnt skip a beat in speed. I use this in my home office all day long it keeps up with my reports and all. I was so surprised. This is perfect for daily use. . This desktop is fast, beautiful and doesn't take up much space. I recommend it. I love it and I think anyone who purchases it will too!!! This is my first experience with an HP all-in-one. I am loving it so far! I was very disappointed when this computer first arrived. The start up function was excellent and walked me thru every step, I was very excited. Then the updates started. I was unable to use the computer for 4 days while the ancient software updated. I can understand a few updates, but 4 days is ridiculous! The design of the all in one is sleek and well made. It has been stable in each area that I have set it in. Now that it is updated all of the software is loading correctly and is fast. 1 TB of storage is more than enough for my schooling and home life(pictures, bills, music) Overall I am happy with the HP All-in-one. I recommend getting a Bluetooth mouse and keyboard, I hate the wires. I wasn't sure what I was excepting, coming from a line of 1500.00 laptop computers. Bought this for a home office, thinking I wouldn't use it all that much. The screen is nice and I appreciate the incorporate DVD drive (they are so hard to find now days...). However, it's slow. I've never had a computer in this price range so I honestly don't know how it compares to others. It's not so slow where I can't deal with it, but there is definitely a noticeable lag. However, for the price, I am pleasantly surprised at what I got. Would definitely recommend for your basic office computer. This product is nice. It is a white, all-in-one PC equipped with its own stand, 4 USB ports, a mouse and keyboard. It is a flat screen that has over 900 GB's of storage space, which is impressive. It is a Windows 10 operating system that is user friendly with the integration of Cortana. The setup process is less time consuming than prior experiences with other devices. Overall, the process was uncomplicated thus providing the ease of synchronizing additional accounts. Cortana assists the user every step of the way. This PC allows you to talk through the setup process or click through the process using the mouse. However, I am still assessing all the pertinent components of this product. I like the keyboard layout, however I would appreciate a keyboard that lights up, or the keys are highlighted. The majority of the time I type in a dimly lit setting and it is difficult to see the keys without a desk lamp. I also admire the style and the slim design of the PC, however, I dislike the fact that the operating system itself is pretty slow. Some apps take too long to load. The PC has preloaded apps, all of which are apps I don't want, need or use. Some programs are non-functioning. It does have a webcam, which is essential. The PC also has accessibility which is paramount to my daily use so I'm able to adjust the display to my personal specifications. This PC has awesome sound quality, the volume grows increasingly loud. I can utilize Cortana to adjust the volume. The primary search engine is Bing. This PC has DVD/RW drive however, I cannot locate it at this point. Overall this is a nice system equipped with Microsoft Word, Excel and Powerpoint. An interesting facet to this PC is the Microsoft Reality portal (MRP) that is preloaded on the system. Unfortunately, the MRP would not proceed for some reason. It requires 2GBs of space. I have that, much to my dismay, I could not follow through on the install. Fortunately, I can search, work, download, check my email, and watch movies, which is all I can ask for at this point. i bought this and took it home. it wouldnt even turn on. power light came on but absolitely no light on screen it was completely dark and black had to return it. got another of the same and it seemed to work... but it had somethjng wrong with it too.. it froze up any time you clicked anything. and it had just been opened earlier that day. so slow. Purchased this desktop, the picture/display was very nice, sound was good but after initial set up it was VERY slow, started freezing up, would not navigate or open any websites. After just a couple of hours trying to use the computer running at a snails pace.....I attempted to shut it down, it was not shutting down properly, screen went blank and message "signing off" appeared, it stayed that way for a few hours, at that point I still could not power it off or do any commands, I unplugged it, let it sit overnight unplugged thinking it would be operable the next day. The next day after plugging it in it still showed a blank screen with the message "signing off". I then returned it to the store for a full refund. DISAPPOINTED!!!!!! !